Over the past weekend, there was a Geek & Sundry Twitch stream at a gaming convention at SXSW in Austin, TX, and one of the board games they featured on the show was made by Asmodee (famous for such games as “Splendor,” Takenoko” and “7 Wonders,) called “Concept.” Felicia Day and her brother Ryon played this on the stream with a couple of random strangers at the gaming convention, and it looked really fun and engaging. The board has vibrant colors, both in the neon-colored pieces and the icons on the board, and you are encouraged to shout out your guesses as soon as they come to you just like in Charades or Pictionary, but with less physicality required. If no one gets the word or phrase, more clues are forthcoming until someone wins the round. When a person guesses right, points are doled out to both teams, and the player with the most points at the end wins. 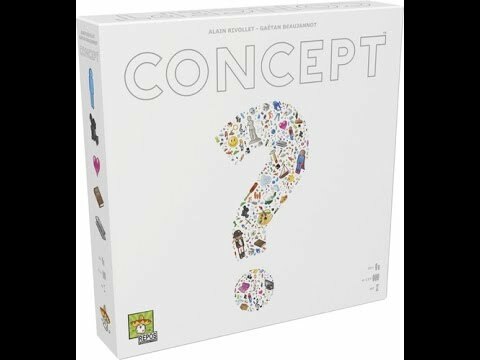 “Concept” earned a Golden Geek nomination at BGG.Con in 2013, and it won the As d’Or (Golden Ace) Award at the Cannes Festival International des Jeux in 2014. This is a game that looks like a fast, fun party game with a unique board mechanic that anyone can enjoy, and I look forward to trying my hand at this game very soon.